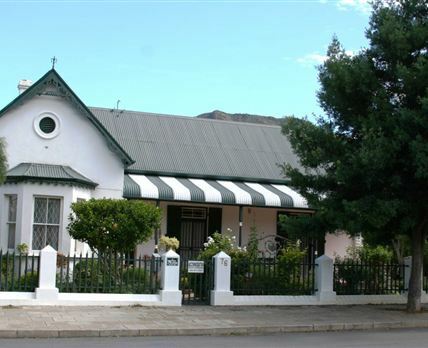 Die Ark is a fully equipped one-bedroom unit, situated in a quiet and secure area of Graaff-Reinet. The unit is within walking distance of restaurants, shops, museums and other attractions. The oldest town in the Eastern Cape, the fourth-oldest in South Africa and certainly one of the most atmospheric, Graaff-Reinet lies enclosed by a bend in the Sundays River, overshadowed by the rocky Sneeuberg Mountain within the Camdeboo National Park. Graaff-Reinet has retained much of the character of a typical nineteenth-century town and is well worth a visit because of it. Although Graaff-Reinet is in the Karoo Heartland with its flat, sandy plains and incredibly hot summers, it is encircled by the Camdeboo Park, which breaks the sandy monotony with its rich greenness and mountains. Within the park are the Nqweba Dam and the Valley of Desolation, providing some of the best examples of the unique-jointed pillars formed by dolerites, which rise to heights of 120 metres in places. Because of the diverse geography of the area, there is a rich bird and animal life. There is trout fishing, horse riding, Graaff-Reinet’s Bird Club and the national park is stocked with game. Click here to enquire at Die Ark.